It was pandemonium in Jamaica last evening as the nation joined the athletic and sporting world in witnessing history. Jamaica's own 'son of the soil', Usain St. Leo Bolt, won the men 100 meters race at the Rio Olympics to become the only human to win 3 back to back 100 meters Olympic titles! You probably saw my note that preceded this? Yeah, there was an extreme level of tension & anticipation going into the semifinal of the Men's 100m final - especially so as many thought that Bolt was still not at his very best. He looked OK in the heats, but the result from the 2015 world championships has taught me (and many others) never to doubt a champion, and moreso someone with the name, Usain Bolt. The commentator exclaimed, "He's immortal now!" It is one of the greatest athletic achievement of all time, if not the greatest". "You have just seen a moment, the likes of which, none of us is ever likely to see again in this lifetime, or any other for that matter - he is a legend". "He creates an electricity and an atmosphere that no other athlete can produce", he continued. And by the way, I want to take time out to single out Justin Gatlin. He probably made some mistakes but he remained a solid rival to Usain Bolt - despite the unfavorable criticisms . I was really impressed with his statement. Well said Justin! And thanks indeed for pushing Usain. Surely, his races would not have been as exciting without some like you driving him to be his best! And by the way, we might still be in for another treat as Bolt remains on target to leave Rio with a third successive Olympic treble, having won the 100m, 200m and 4x100m relay titles in 2008 and 2012. He has made us here in the USA very proud. We were in a restaurant watching the race, when he won the entire place was in an uproar. He is truly blessed with a gift. I'm overwhelmed by his performance. God has given him the ability to excel in this manner. I keep him in my prayers. All Jamaicans should be Proud. About Usain Bolt one commentator says he is from another Planet. Even though the video cannot be played, I was watching along with millions of other people as it was happening. 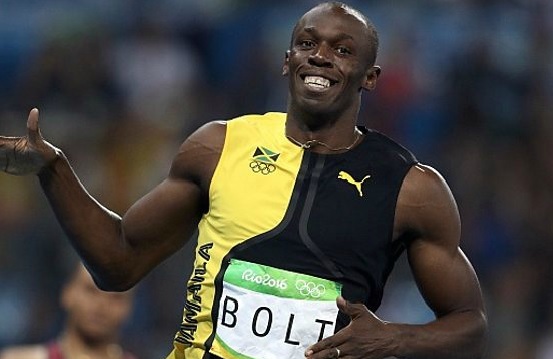 Usain Bolt is an amazing athlete, and it was so exciting to see the celebrations in the streets of Jamaica. He has made his mark in this world and Jamaica must be so proud. Mohammed Ali's competitor as The Greatest!! mother is Jamaican! Go Jamaican blood! Please note that it is a Youtube.com video and it might take a while to load. Please note also that some ISP's especially at the workplaces, block Youtube, Gmail and other social sites, so just be mindful.